In a nutshell: Most speakers don't come with speaker wire. 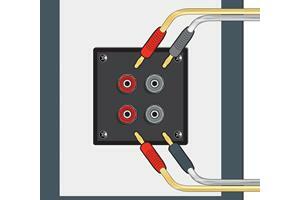 It’s up to you to select the right gauge (thickness) and type of wire for your system. 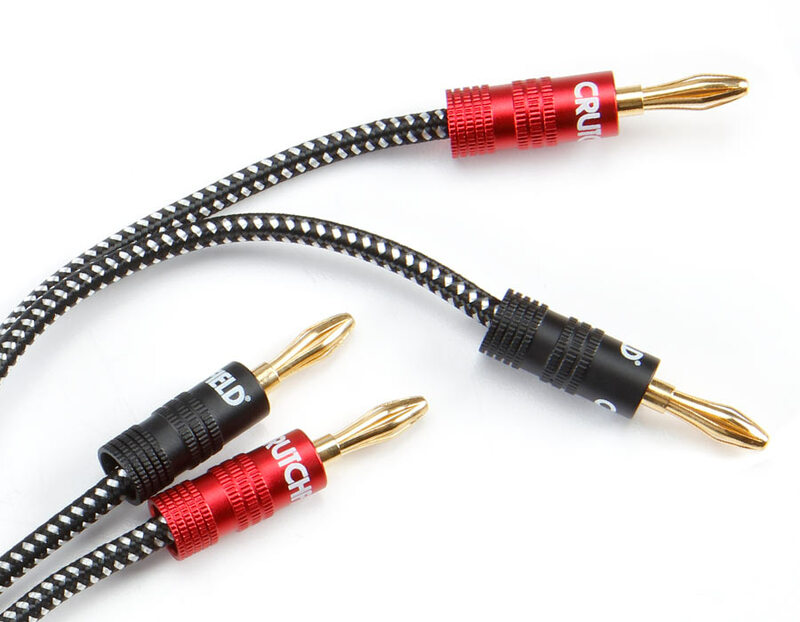 You can buy speaker wire with connectors or without. 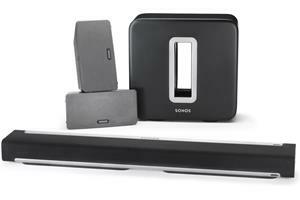 For in-wall or ceiling speakers, you'll need UL-rated speaker wire labeled CL2 or CL3. 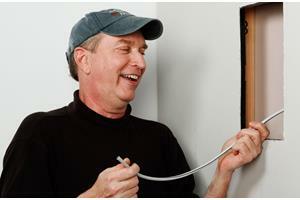 Read our in-wall wiring guide for more information. 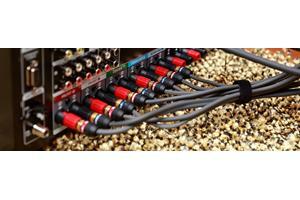 To run wire underground to a set of outdoor speakers, buy wire rated for direct burial. 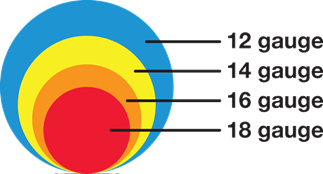 Wire thickness is identified by its American Wire Gauge (AWG) number. The lower the gauge number, the thicker the wire. Thicker wire presents less resistance to current flow. Relative thickness of wire gauges, drawn to scale (not actual size). 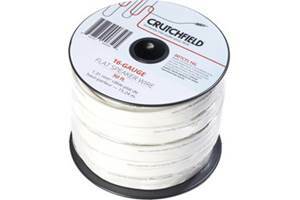 Thick wire (12 or 14 gauge) is recommended for long wire runs, high power applications, and low-impedance speakers (4 or 6 ohms). For relatively short runs (less than 50 feet) to 8 ohm speakers, 16 gauge wire will usually do just fine. It’s cost-effective and easy to work with. Ask your advisor to recommend the proper gauge for your installation. To figure out how much speaker wire you need, run a string from your receiver or amplifier location to each of the speaker locations. Measure the string, and then add a few extra feet (to provide some slack for easier connection to your gear). If you buy wire that doesn’t come with connectors, I strongly urge you to buy banana connectors. Attaching bare wire ends to a home theater receiver is a real pain. If you're going to run speaker wire inside your walls or ceiling, you'll need UL-rated speaker wire labeled CL2 or CL3. 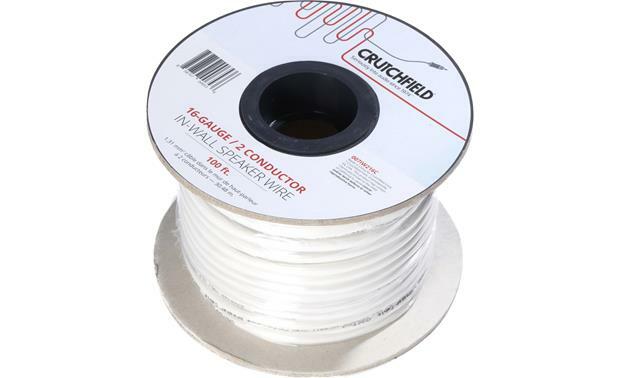 If you want to install your outdoor speaker wire underground, you'll need wire rated for direct burial. 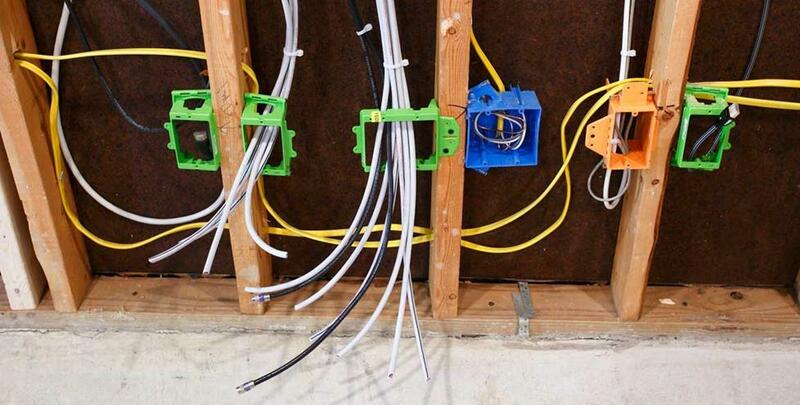 Take a look at our comprehensive in-wall wiring guide for more information. 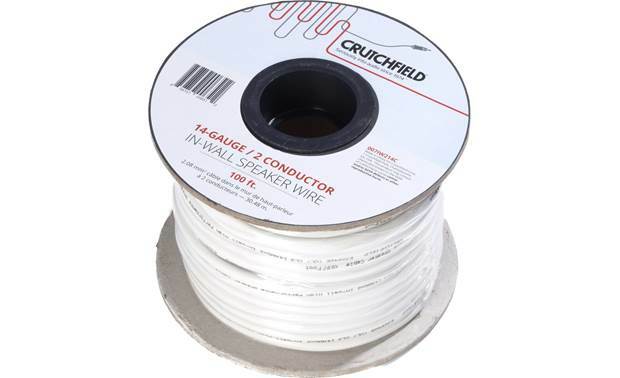 In-wall wire is available with two conductors or four. 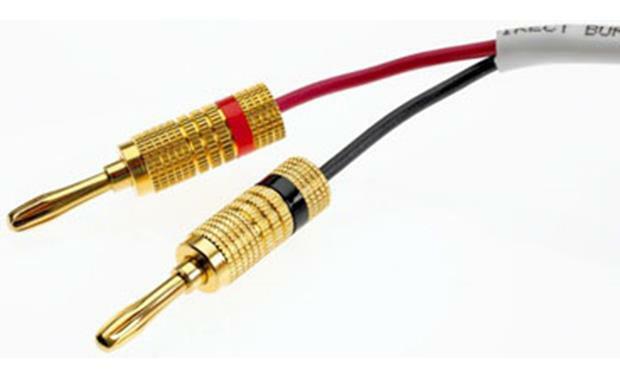 With a 4-conductor cable, you pull a single cable over the long distance from your amplifier or receiver to an in-wall volume control in another room. You can then run 2-conductor cables from the volume control to each of the stereo speakers in that location. 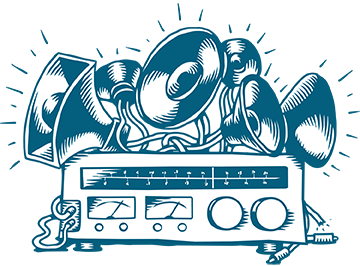 Four-conductor wire is also good for connecting stereo-input speakers. 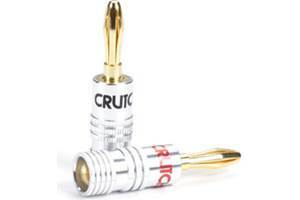 Ask a Crutchfield A/V designer to recommend the right kind wire for your installation. 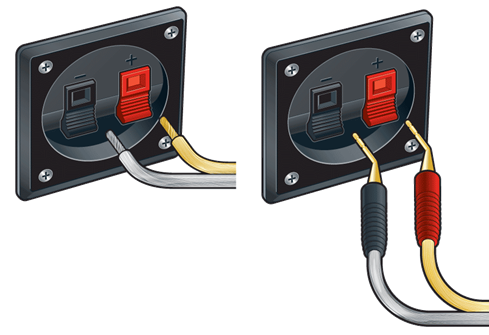 Pull 4-conductor wire to an in-wall volume control (left) or a stereo-input speaker (right). 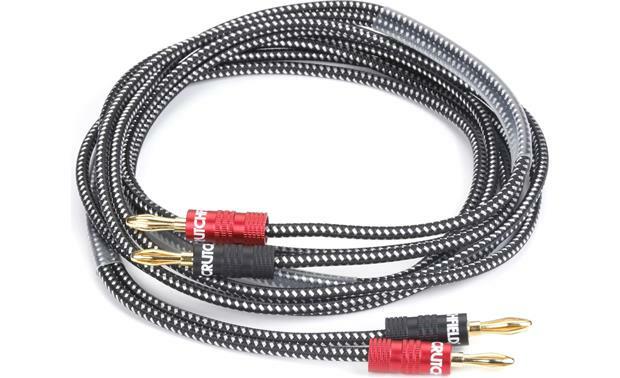 Are high-end speaker cables worth it? 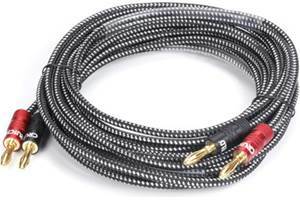 Look at our wide selection of Audioquest speaker cables. Read the (mostly 5-star) customer reviews. People rave about the quality of the construction and the sonic improvements they hear. 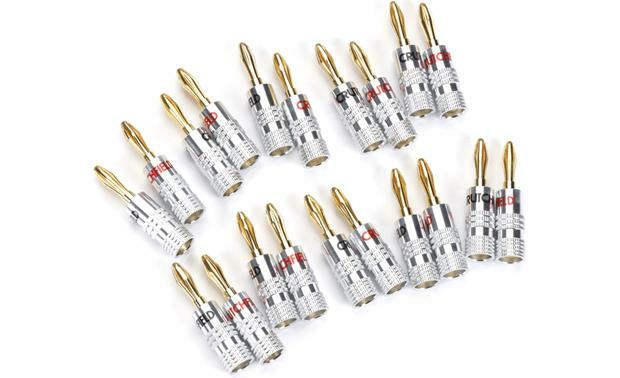 Identify the positive and negative leads of your speaker wires, and make sure you connect them accordingly to your speakers and your amp or receiver. If you get one of the connections crossed, your music won’t sound right. If you decide to hook up your wire without connectors, use a wire stripper to take about 3/8-inch of insulation off the ends of each lead, exposing the bare wire strands. Twist each lead's bare wire strands tightly, so no stray strands are sticking out. Loose strands could make contact with the cable's other lead and cause a short circuit, potentially damaging your components. From left to right: bare wire, pin connectors, spade connectors, single banana connectors, dual banana connector. 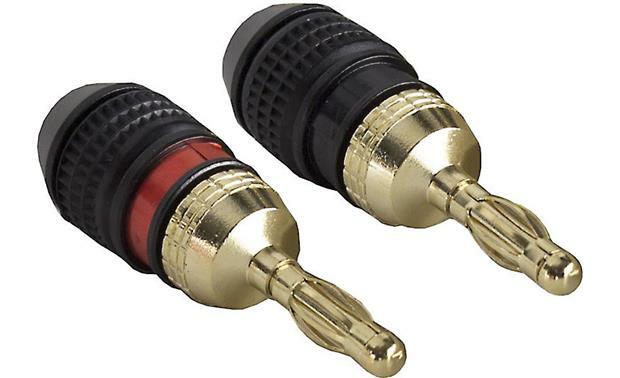 Speakers have one of two different types of speaker wire terminals — spring clips and binding posts (see illustration below). Spring clips are very easy to work with. 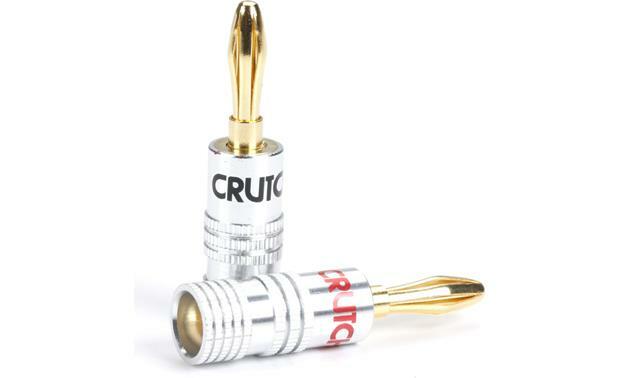 Simply press down on the clip, insert the speaker wire, and release. The spring-loaded mechanism holds the wire in place. 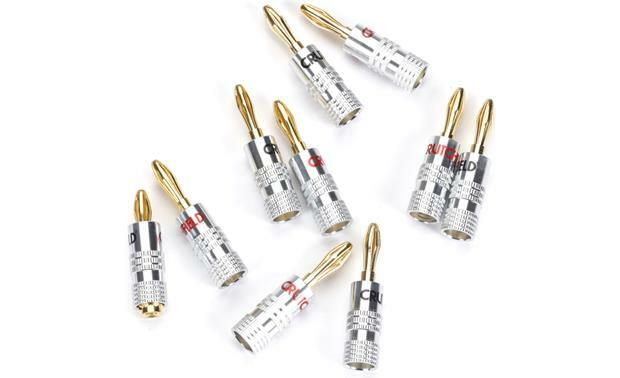 Spring clip terminals can accept bare wire and pin connectors, but not spade connectors, banana plugs, or dual-banana plugs. Spring clip terminals accept bare wire or pin connectors. Binding posts provide a very solid connection for your speaker wire. Unscrew the collar to reveal the hole used to connect bare wire and pin connectors. Banana and dual banana plugs connect directly into the hole in the center of a binding post. A spade connector slides around the collar and is secured once you screw the collar back down. See our complete selection of connectors.